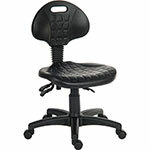 430-560mm seat height, 5-star black castor base. Height adjustable ergonomic chair designed for industrial environments with polyurethane seat and back. Durable 5 star base and castors for easy manoeuvrability. This chair is comfortable, hard wearing and easy to keep clean, the backrest can be set as floating or fixed permanent contact and the seat can be tilted for additional comfort, seat height is easily adjustable by gas lift from 430-560mm.